The Cutty Sark epitomises the great age of sail; she is the last surviving tea clipper. It is hoped Cutty Sark’s innovative design and triumph of engineering will set a new benchmark of how historic ships are preserved from now on. The biggest overhaul of the Grade I listed landmark for 50 years commenced in 2004 with a comprehensive programme of conservation, with the ship’s reopening planned to take place in 2009. However, the project was brought to a dramatic halt when a fire in 2007 swept through the wooden structure, causing extensive damage to the centre of the ship. This disaster initiated a major fundraising campaign, resulting in the project restarting at the end of 2009 with the design brief enhanced. When the Cutty Sark was brought to Greenwich from Shadwell Basin she was housed in a dry berth, created in the 1950s, and purpose built in mass concrete on a former bomb site. The ship was floated down the Thames, and manoeuvred into the berth before the end was sealed and the water drained to allow her to rest on the floor of the berth. 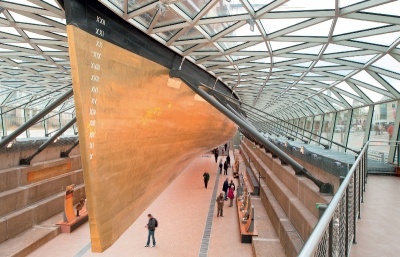 The new design and conservation solution proposed to raise the 963t Cutty Sark three metres within the constraints of the dry berth, and demanded that the new interventions had to respect, repair and adapt to the original fabric of the ship. A complex but elegant pre-stressed system hangs and stabilises the ship in its new position. This steel structure will preserve the shape of the ship’s iconic hull and has enabled an additional public space to be created in the dry berth below, allowing visitors to walk underneath and admire the ship’s form. 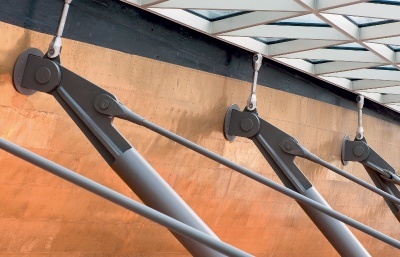 The Cutty Sark project features innovative use of structural steel for the conservation and interpretation of a unique Grade I listed ship. In order to achieve this, precise three dimensional surveys were carried out and every new detail was digitally modelled. Work was carried out to tight tolerances and demanding geometries, at times twisted and curved. Every element of the new steelwork was costed throughout the process, allowing optimisation and management of the design. When the timbers were removed the true extent of the iron frame’s corrosion was exposed. All of the salt induced corrosion was painstakingly removed and sections of new steel ribs were installed. At the bottom of the ship where the ribs connected to the keel, this involved substantial work as the iron had completely dissolved. The original conserved ironwork is identified by the white painted vertical ribs, horizontal keelsons, deck beams above and their supporting posts. In contrast, all new strengthening steelwork is painted grey. Redistributing the weight of the ship required the vessel to be lifted at regular intervals along its length so 12 new triangulated steel frames could be installed. These frames take the form of an inverted coat hanger, with two tie rods from the ship’s keel running diagonally up to each end of a horizontal strut that spans the width of the ship immediately beneath the Tween Deck. This inverted hanger frame carries the weight of the ship’s keel and masts back up to the new external support points. The 12 sets of horizontal beams and diagonal ties form a triangle between the strake plates and new box keelson which encases the ship’s original keel, fixing its vertical position and preserving the ship’s iconic shape from within. A thirteenth cradle completes the system by connecting the stern of the ship to the keel. The new steel cradles have been integrated with the existing fabric of the ship wherever possible. The cradle system is fully adjustable via giant turnbuckles set within the primary ties and struts, which ensures a perfect fit to the existing ship fabric and dry berth. The 24 inclined struts carry the weight of the ship and its visitors down to the mass concrete of the original dry berth. The intense collaboration between designers, specialists and contractors has resulted in a cost effective, robust and elegant solution that will preserve the iconic ship for generations to come. The journey through the interior of the ship begins in the hold, the storage space used for Cutty Sark’s cargo. A new steel deck is provided to act as both a passageway and a viewing point for the interior of the hull. Visitors can then walk through the main exhibition space (the Tween Deck) where their route continues from the weather deck across a new suspended bridge to the access tower, a new ancillary structure on the starboard side of the ship. The visitor then reaches the opening to the dry berth, arriving below the lifted hull of the Cutty Sark for the first time. Resting three metres above, the contours of the muntz clad hull are visible as if the ship is suspended in water, with the glass canopy enveloping the space to meet the hull at its highest waterline. Proudly displayed, and conserved for a further 50 years, the last surviving tea clipper maintains her rightful position in the heart of Greenwich as an emblem of Britain’s rich and fascinating maritime history. The steelwork enables this famous ship to be preserved and, importantly, to be viewed internally and externally from below the hull. The inclined steel struts support the ship, and the timber and refurbished iron members and internal steels maintain the hull’s original shape. The steelwork has been very carefully and sensitively detailed by the use of extensive 3D modelling. Ingenious steelwork is key to this remarkable visitor attraction.